Why is there a need for a back-up solution? In some cases, the eCOA user (investigator/site staff, patient, or observer) may not be able to use the usual eCOA device for questionnaire completion. Device is broken or not usable due to hardware problems. Device is not operating correctly due to software or study programming problems. A network connection is not available but necessary for electronic data entry*see note below comparison table. Device is not available, e.g. lost or currently in use by another person. The problem could be temporary (e.g. a network issue or if the device is already in use by another user) or permanent (e.g. if the device is physically broken). This does not change the immediate need for a back-up solution, but could reduce or remove resolution efforts. Clearly, an eCOA user should be able to perform the required actions as needed. However, the reality can be more complex. While the unavailability of a device is problematic, the consequences do vary. Planning for back-up options requires a consideration of the complete system, including risk assessment. Criticality of eCOA data for the study (e.g. primary/secondary versus exploratory endpoints, inclusion criteria related to eCOA data). Risks around the study power being too low. Actions that can be delayed (e.g. waiting for eDevice availability) and actions that should take place regardless. Factors external to the eDevice itself (e.g. score calculation, direct communication with IRT for randomization purposes). Finally, it is key to bear in mind that the user will be inconvenienced by device unavailability. Having planned for a back-up solution and trained users will not only help patients for the collection of diary data but will also help sites manage such unplanned but predictable events. Which back-up solutions can be introduced? A range of back-up solutions need to be available to cover different scenarios, as is the case at Kayentis. 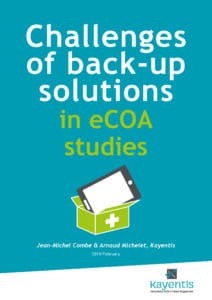 The study protocol and associated processes are key elements for the back-up assessment and the accurate evaluation and mitigation of risks to provide the best back-up solution for a specifc study. Use an alternate electronic data entry solution: data entry using a web portal? Set up a stock of spare devices? Set up an efficient deice replacement process? Guarantee data capture with paper and perform data entry later? Back-up data capture with IVRS?